Kombiner din gamle Beijing sightseeing oplevelse med flere forskellige kulturelle aktiviteter på denne uforglemmelige, multi-part tour. Mød din guide direkte på dit hotel, og rejser til Peking's hutongs-traditionelle gyder og gårdhave boliger, der har været en del af byen i århundreder. Udover en sightseeingtur i området deltager du også i en kinesisk opera maske maleri session efterfulgt af en te ceremoni. For en opgradering kan du også tilføje et traditionelt lokalt måltid til din rejseplan. We thought that you will get some background Information on the Hutongs and the Opera Mask Painting. This was not the case. Instead they wanted to sell us additional tours over and over... We refused and the tour ended after 90 minutes. This was not worth the money. Better do it on your own. 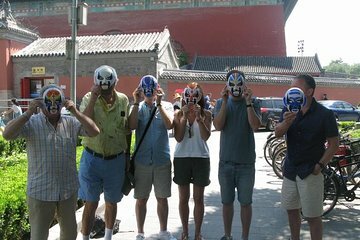 The mask painting was relaxing and fun while the Hutong tour was eye-opening. My round of applause and thanks to our guide Storm, driver Vicky and the gentle opera mask painting teacher. They each participated in making this an enjoyable tour. Roger did a great job! We learned a lot during our tour and had fun painting the masks. The food was delicious and the interaction with the family was a lot of fun.